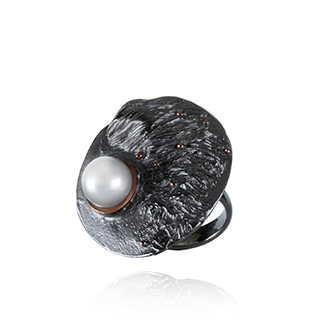 A solid sterling silver statement ring with black rhodium finish and 18 karat rose gold accents featuring a white fresh water pearl. Keiko Uno’s Ocean Bed series is inspired by the alluring patterns and textures of the ever changing ocean floor. The Ocean Bed series forms part of Keiko Uno’s luxury sterling silver Rockpool Collection.